Jerry E. Berland, M.D. is Board Certified in Ophthalmology, and fellowship trained in Pediatric Ophthalmology and Adult Strabismus. His specialty is comprehensive medical and surgical eye care in children, including surgery to correct eye muscle imbalance, tear duct obstruction, cataracts, glaucoma and abnormalities of the eyelid. He also specializes in eye muscle surgery in adults. Dr. Berland is the Assistant Chief of Ophthalmology at Children’s Healthcare of Atlanta at Scottish Rite and has a distinguished background. He has been named in the Atlanta Magazine and US News and World Report "Top Doctors" publication on multiple occasions. He had the honor to serve as President and Vice President of the Thomas Eye Group. As Assistant Professor in the Department of Ophthalmology at Louisiana State University School of Medicine, he taught eye surgery to younger doctors. He is most proud to have served as an eye surgeon in the US Army Medical Corps at the rank of Major. 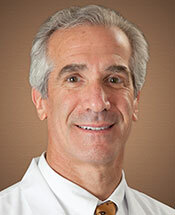 In his leisure time Dr. Berland enjoys time with his family and is an avid surfer, sailor and skier.